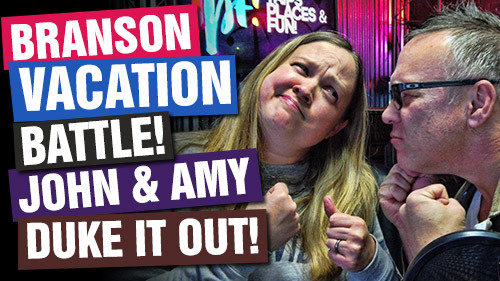 John and Amy duke it out as they present their versions of a fun, low cost and adventurous Branson, Missouri vacation! They reveal their choices for lodging, dining, attractions and shows including Six, Silver Dollar City, Dolly Parton's Stampede, Showboat Branson Belle, Escape Code, The Axe Game and MORE! Now, it's your turn! Comment below and VOTE for the winner! Did John or Amy have the best ideas for an epic Branson, Missouri vacation? Don't leave them hanging!